where apples are grown for the handcrafted cider made in Edmonds. Fresh, local sea asparagus will be featured with hard ciders for the first time. If you haven’t tried sea asparagus, here’s your chance to taste the unusual plant that’s growing in popularity. It’s in season for about six weeks and will be sold at the Core Hero Hard Cider booth starting June 17 at the Edmonds Farmers Market. 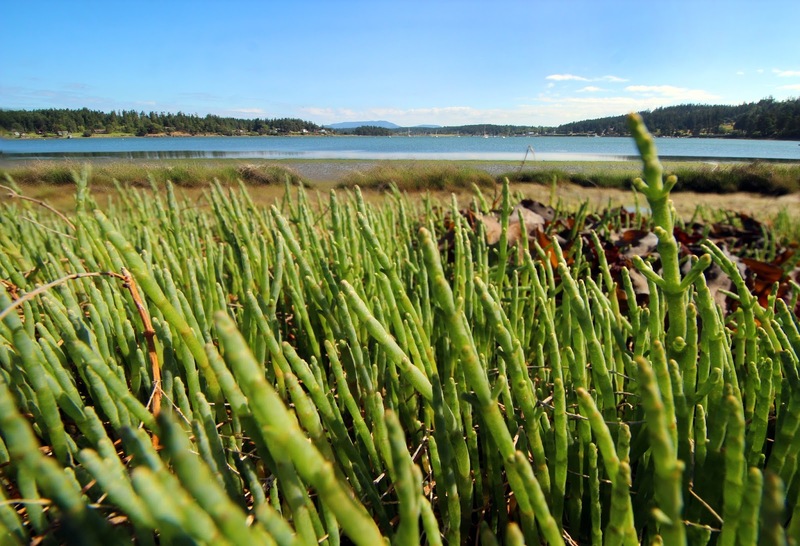 “On my hands and knees, I pick the sea asparagus that grows wild near a small apple orchard I manage at Lopez Island,” explains Steve Kaiser, owner of Core Hero. Sea asparagus is salty and slightly bitter when raw. Steve recommends you soak it in water for about one hour to reduce the saltiness. After soaking, blanch in boiling water for one to two minutes and immediately submerge in ice water to stop the cooking and prevent discoloring. Then, either saute with reduced hard cider or with garlic and butter. Recipes, market dates and hard cider store locations are available at the booth and at the website. Update: He will be at the LFP farmers market on June 25 and July 23.